Business is a contact sport. And every contact counts, as does the way you treat them. After all, your customers are your competition’s potential customers. And those you’ve yet to reach, well, their business is only one good play away. The competitor who wins their business will most likely do so by utilizing whatever means possible to reach them first and best. Make no mistake about it, whether your competition considers you a threat or not, they want you to be a casualty. Imagine if, in addition to all the other fun ways you use your mobile devices, you now have instant recall with photographic-memory-like detail regarding every contact in your network, and everything you know about them. Sure, your competitors can see that stuff, too. Not much of a competitive advantage there. Instead, you can go above and beyond by capturing, recording, and following up on the information you exchange privately. Whether you work for yourself, a small company, or even a large one, everyone is his or her own business. Your “employment” is dependent on results, most of which don’t occur without a strong network of real relationships. Further, whether you like it or not, everyone is in sales. That’s right, whether you’re an accountant, attorney, or architect, what you are is a salesperson. Why? Because even if you’re not selling a product or service, you’re selling your ideas or your methodology, even if it’s just to your supervisor. The bottom line is that we all deal with people and are therefore relationship-centric to some degree. Managing those relationships more effectively than your competitors, even those in your own organization, gives you a competitive advantage. Don’t forget that every person with whom you have a relationship also represents countless others, the people in their networks, with whom you could potentially reach, as well. Demonstrating concern, credibility, and competence could determine whether or not you obtain access to them. Who would risk their own reputation by recommending someone whom they don’t know or who hasn’t earned their recommendation? For that reason alone, using your mobile device to build and strengthen relationships gives you a competitive edge in growing your business, by turning existing customers into repeat and perhaps even into referring customers. Mike Muhney is a recognized expert in the field of relationship management. He is the co- founder and co-inventor of ACT!, the software product that created the entire Contact Management software category and is acknowledged as the catalyst that started the entire CRM (Customer Relationship Management) industry. Today, he is the CEO and co-founder of VIPorbit Software, creator of the Mobile Relationship Management category for users of smartphones and tablets, beginning with the iPhone and iPad. 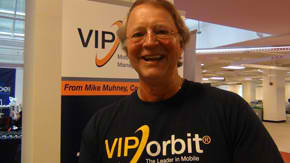 VIPorbit provides full-featured, affordable solutions to today’s mobile device user. VIPorbit can be downloaded from the iTunes App Store or www.viporbit.com.